A concentrated extract for intensive care of scalp experiencing recurring dandruff of various origins. It reduces causes and symptoms of such scalp issues as: itching, irritation, oil. Excellent moisturising and soothing properties limit the amount of dry flakes visible on hair and clothes. It counteracts dandruff-related problems such as: excessive hair loss, fragility, brittleness and lack of shine. It prevents the development of pathogenic bacteria and fungi. 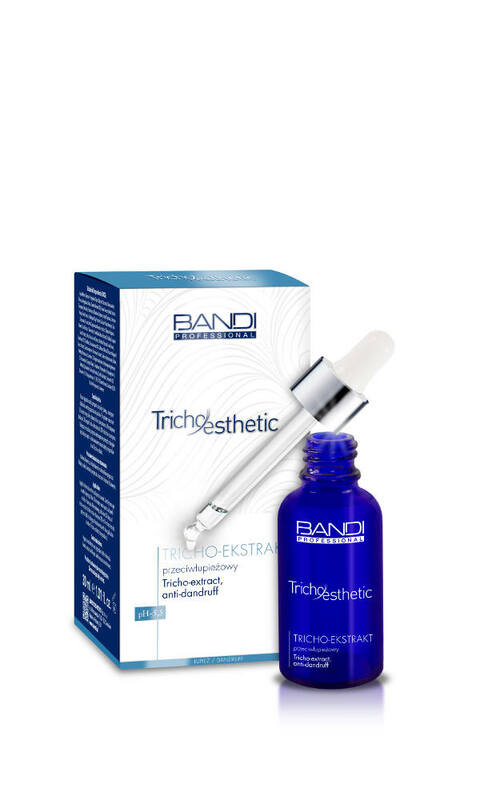 Tricho-esthetic is the first polish, professional line of trichological products, developed by experts in scalp care. It has been created to complement pharmacological therapy, increase its efficiency to prolong the effectiveness of treatment for healthy, strong and beautiful hair. The line includes products developed for the most common problems of the scalp and hair. Cosmetics for prophylactic are designed for regular care. One of the main components of formulations is provitamin D3. Provitamin D3 - organic chemical compound that is a precursor of vitamin D3. Recent studies point to its reduced level occurring in the course of baldness. ginseng, amino acids, vitamins E, B3, pro-vitamin B5, plant extracts from: burdock root, peppermint common, lemon balm, horsetail, fenugreek thyme, horsetail, probiotics and prebiotics, lactic acid, formic acid, silk proteins, allantoin, complexes soothing and conditioning hair. Apply the formula on the scalp once a week. Gently massage in with fingertips. After 30 minutes wash your scalp with a Tricho-shampoo. Alternatively, add about 30 drops of Tricho-extract to the Tricho-shampoo 200 ml. For best results perform full trichological treatments with the application of other Tricho-esthetic line products.